Federal University Oye-Ekiti (FUOYE) is now selling forms for admission into its Postgraduate Diploma (PGD), Masters and Ph.D programmes for the 2019/2020 academic session. See the requirements, courses available and how to obtain FUOYE postgraduate form below. Applications are invited from suitable qualified candidates for admission into the Federal University Oye-Ekiti (FUOYE) postgraduate Programmes for the 2019/2020 academic session. Before you proceed, check: FUOYE Postgraduate COURSES. These programmes are available to holders of Master degrees, with a minimum of 60% score in their Master degree programmes. A Ph.D. degree programme runs for a minimum period of 36 calendar months and a maximum period of 48 calendar months for full-time students OR a minimum period of 48 calendar months and a maximum period of 60 calendar months for part-time students. Note that relevant courses will be taken for the Ph.D studies including a supervised Thesis where prescribed. Candidates who score between 55.00% and 59.99% Cumulative Grade Point Average (CGPA) at Master’s level can apply for admission into the M.Phil/Ph.D programme on full-time basis. The programme runs for a period of 12 calendar months after which the candidate, on good performance can transit to the Ph.D programme. Candidates in this category are eligible for conversion to Ph.D. candidature, following a progress assessment report to be made by a Panel of Examiners at the end of the first session of registration. Candidates must score not less than 60% (aggregate) at the end of the first session to be eligible for conversion for the Ph.D. programme. A candidate applying for the Master’s degree programme must have made a minimum of Second Class (Lower Division) in his/her Bachelor’s degree programme. Master’s degree programmes run for a minimum period of a year (12 calendar months; that is, two semesters) and a maximum period of two years (24 calendar months; that is, four semesters) for full-time candidates OR a minimum period of two (2) years (24 calendar months; that is, four semesters) and a maximum period of 36 calendar months; (that is, six semesters) for part-time candidates depending on the peculiarities of the Department. All Master’s Degree Programmes are by course work in addition to a research work/report at the end of which a dissertation is produced. Applicants are to note that, a programme automatically lapses at the expiration of the maximum duration for each programme. However, a candidate may apply for an extension of not more than 12 months. Candidates in regular employment must submit with their applications, formal letter of release for postgraduate studies issued by their employers. 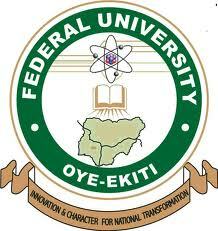 Also, all applicants who are not graduates of the Federal University Oye-Ekiti (FUOYE) must request their former Universities or institutions to forward directly to the Secretary, School of Postgraduate Studies the academic transcripts of their First Degrees or Master’s degree with respect to applicants for Master’s and Doctoral Degrees, respectively. How to Apply for FUOYE Postgraduate Admission. Candidates should pay a sum fifteen thousand naira (N15,000.00) through REMITA platform MDA: Federal University Oye Ekiti- 1000134. Go to http://postgraduate.fuoye.edu.ng/. On the home page displayed, click Application Instruction and read carefully. Click on apply now to start new application or click on login to continue application after payment. Candidates should click OK button on the dialog box displayed and enter your names. After Login, click on Continue Registration link on the main menu. Fill in your other bio-data and necessary details truthfully on the webpage. All candidates should upload their Passports pictures by clicking on Browse button and select your picture. Your Passport pictures must not be more than 20KB. On completion of bio-data, click on Next Step button then click OK on the message dialog box. All candidates should complete the programme of choice and click on Save then click OK on the message dialog box. On completion of choice of programme click Next Step button. Deadline: This application shall close six (6) weeks from the date of this publication.